All our addons are now available for free, but as a result, we do not support them anymore. Commercial support is still available on demand, please contact me directly if needed. Show your website addon guts! 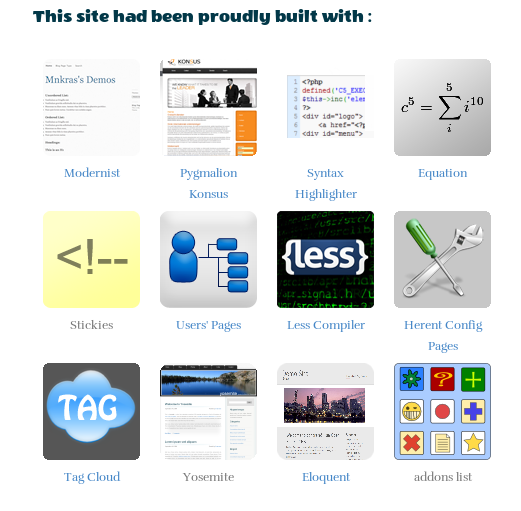 Allows a user to advertise which addons have been used to build a website. This simple addon displays a list of all installed addons with an Icon, their name and a link to the marketplace. You can choose if you want to display the name only, the icon only and whether you want or not to link it to the marketplace. Warning: links to the marketplace are only available if your site is connected to the community.